EUGENE, Ore., Sporting Alert – The following are selected results from the first day of competition at the 2016 Prefontaine Classic at Hayward Field in Eugene, Ore., on Friday night (27). Among the winners on the night were Great Britain’s Mo Farah and USA’s Joe Kovacs, who both produced world-leading performances to win their respective events. 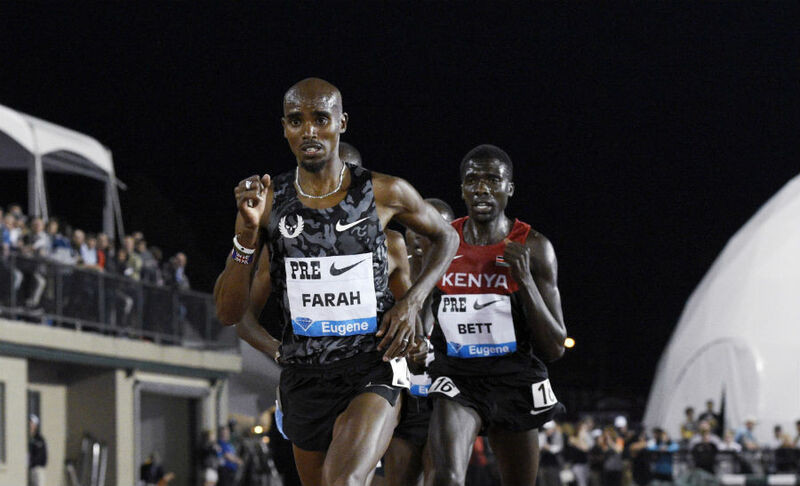 Farah sprinted away to victory in the men’s 10,000m with a time of 26 minutes and 53.71 seconds, his third fastest time ever, while winning the 10k for the third time at the Prefontaine Classic. The World and Olympic champion, who lowered the 27:19.71 by Ethiopia’s Leul Gebrselassie, which was set two-weeks-ago, also won in 2011 and 2015 with sub 27-minute times as well. A total of 19 runners finished with times faster than 28-minutes, and five of them clocked a time quicker than 27-minutes. There was also a world-leading performance in the men’s shot put, with American Kovacs throwing a season’s best 22.13m to dominate his rivals. The Beijing 2015 world champion was bettering his own previous world-leading mark of 21.47m, set at the Triton Invitational on 23 April. In another Hellen Obiri of Kenya won the women’s 5000m in a personal best of 14:32.02, with the top three runners Viola Kibiwot (14:35.13) and Vivian Cheruiyot (14:35.69) also representing Kenya. Brittney Reese won the women’s long jump with a mark of 6.92m, Sandra Perkovic of Croatia taking the women’s discus with 68.57m and Pawel Fajdek Poland to the men’s hammer with a mark of 80.28m.